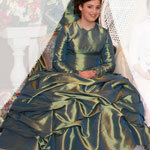 Beautiful iridescent green blue gowns for, Mother and Three Sisters of Bride and Groom. Mother size 14/16 Sisters sizes 12, 10, and 2/4. Their in perfect condition. Prices negotiable. Their absolutely gorgeous, hand made. Get more for your wedding! Don't forget to mention ChossonKallah.com when visiting Wedding Gowns.